My cousin Brandy was visiting last week from D.C, so I have a lot of pictures and stories to catch up with this week. It was lovely to have family in for Thanksgiving (Hálaadás, in Hungarian), which Brandy, Györgyi, and I celebrated on Thursday night with some other great Hungarian gals, Zsanett, Nóri and Brigi. 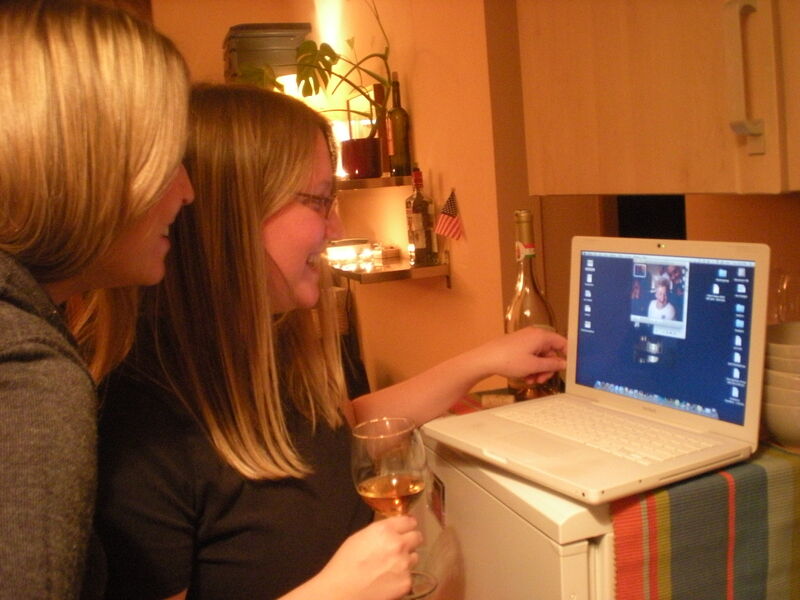 We signed onto ichat around 9pm Central European time and saw our grandmother’s amazement at being able to talk to us live. The week went well even though I was still fighting my seemingly never-ending cold. 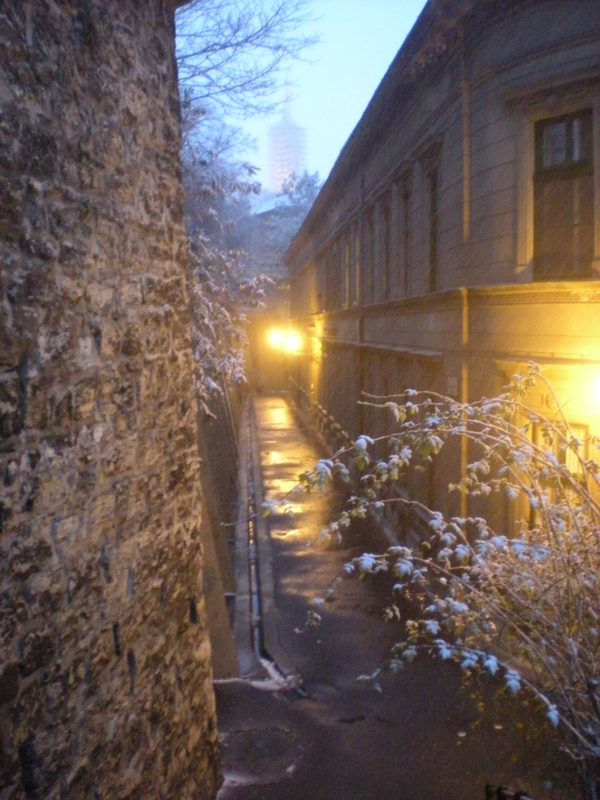 We saw the first snow of the season (something very unusual this time of year), fought the frigid wind chill while touring the castle, and visited several city neighborhoods and towns. 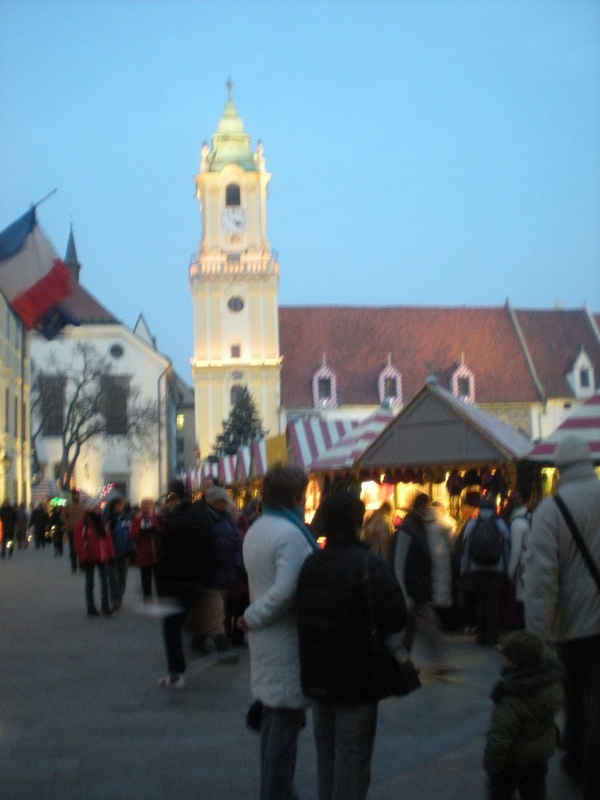 On Friday we even went to the Christmas Market in Bratislava, Slovakia. This time of the year always races by, it seems, but I have to admit to not minding it this year. While I’ve grown to adore my life here in Budapest, and am thoroughly looking forward to the Christmas markets both here and in Vienna, which we will hopefully see in a few weeks, I am officially counting down the last four weeks until I meet my parents and brother in Dublin. This was the best turkey in my life I’ve ever eaten. Thank you so much for showing me Thanksgiving and for the amazing food and hospitality. well i’m glad. and really, despite distances from america, it was the best thanksgiving an ex-pat could hope to have. so thank you 🙂 and brandy. your amazing friends (oreo, cappuccino, and carrot cake). they really made the day amazingly special! I cannot tell a thing about the turkey as i haven’t tried it, but the brownies just made me miss the Buckeye State. Thank you for inviting me, i enjoyed the evening with you. I bet that is Gyorgiy’s first Oreo. What great pictures. Your brie turned out better looking than mine. Thanks for sharing. Does Brandy have your blog address? You’re welcome Noreo. Or is it Nóreo? The carrot cake was amazing, and even better was it to have all of you great ladies there to celebrate Thanksgiving with me!